Your face was rocked off yesterday when you got to Preschool and a whole new Veterinarian's office was set up for your class. 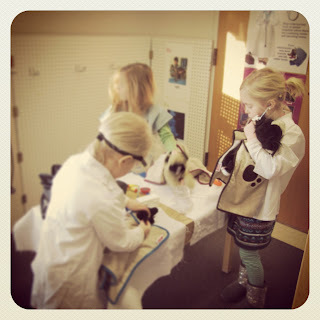 Complete with needy, stuffed pets, stethoscopes, and white lab coats, you were in your element. On the way home, you starting talking about college- it's your new obsession. College, college. We talk about your plans for 13+ years from now like it's something you'll do before the thaw. You definitely decided without a doubt yesterday that you're going to be a Vet when you grow up. You're quite sure you'll attend the same college as your father- because it's where you currently take swimming lessons and is close to home. Makes sense. Yes, you can go there to become a Vet. Or at least lay the ground work towards such ambition. Yes, you bring your own clothes, laptop, music, and learn to make your own food (but not drinks; ahem) in your room. You can have bunk-beds, you have to have a roommate, yes, she'll be a girl, and yes, without a freaking doubt, you can bring your NaNa with. As I tucked you in last night you asked, What if I want to be a princess? Can I still go to college? Do they teach girls how to be princesses at Daddy's College? You have plenty of time to decide what you want to be when you grow up, babe. Princess Veterinarian as a double major? Absolutely.